In the mythical city of N'de lives thirteen-year-old Hadlay and her people, the Ramash. Scorned and abused by the unloving and absent Emperor, the Ramash are poor people, placed second to the ruling class of the Oresed. Young but bold, Hadlay rages against the injustice in her city. When she is chosen for the honor of serving the Prince in the Tower, she hopes to find a way to right the wrong... but soon discovers that things are worse than she believed. While Hadlay works to better her people's condition, she struggles to abide with the abusive Oresed and understand the meaning of her dreams in which a fantastical white horse appears to her and speaks in riddles. 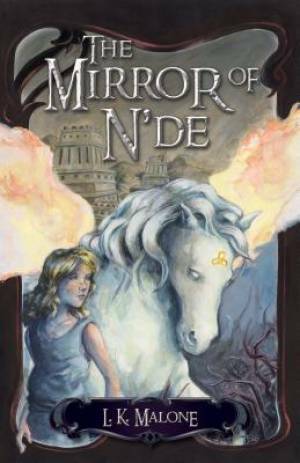 When Hadlay stumbles into one of the Tower's secret rooms, she discovers a hidden mirror that doesn't just show her reflection, but reveals much more: the horse's name is Sirach and he has a plan to save the children of N'de, if only Hadlay can bring them to the mirror. Hiding her knowledge of Sirach from the Prince, Hadlay sets out to do Sirach's bidding. But when Sirach's presence is revealed, Hadley's life is in danger and the only way to save her is for Sirach to give up his own. Crafting powerful narrative and creative characters, author L. K. Malone spins a compelling tale that combines exciting entertainment and the Christian story. In "The Mirror of N'de," readers will empathize with the desires of an oppressed people, will anger at the affliction of a cruel adversary, and ultimately rejoice with the revelation of a Savior. Mirror Of Nde by L K Malone was published by Kregel Publications in November 2011. The ISBN for Mirror Of Nde is 9780825426674. Be the first to review Mirror Of Nde! Got a question? No problem! Just click here to ask us about Mirror Of Nde.